AmeriCorps NCCC (National Civilian Community Corps) is a unique, highly adventurous branch of AmeriCorps. Serving full-time on a team of 18- to 24-year-olds, members travel the country for 10 months performing a variety of intense, multi-week projects. In the traditional NCCC program, members might shelter disaster survivors, build houses, restore the environment, tutor children and more! In NCCC's FEMA Corps program, members support FEMA's disaster responders while gaining skills and connections that could give them an edge toward federal employment. Members receive their initial three weeks of training, and recharge between projects, at one of five NCCC campuses in Denver, CO, Sacramento, CA, Vicksburg, MS, or Vinton, IA. A specially trained Team Leader serves and resides with each team, supervising day and night. Program expenses are provided, to include transportation (no car required), housing, meals, health benefits, uniforms, job training and more. Members also receive $4,000 for living expenses and, most importantly, an education award worth more than $6,000 to pay student loans or future tuition. NCCC campuses provide assistance to members with writing competitive resumes, learning job interview skills and finding the next step in their education or career. For more than two decades, AmeriCorps NCCC has assisted hundreds of nonprofits, schools and government organizations across the country with extra hands to meet their urgent short-term needs. NCCC teams have collectively refurbished 18,531 homes for disaster victims, constructed or renovated 12,400 miles of hiking trails, conducted 1,164 workshops on energy conservation, tutored 374,625 children and countless other accomplishments. Teams assisted devastated communities after Hurricane Katrina, Superstorm Sandy, the September 11th attacks, Hurricane Harvey, Maria and Florence, and many more. FEMA Corps teams have responded to nearly every federally declared disaster since the program's inception in 2012. Teams have met with and registered thousands of survivors for assistance, identified housing resources and provided information to help communities prepare for the next disaster. When no disasters were occurring, teams helped rewrite federal and state plans to provide better disaster response, participated in disaster exercises, operated warehouses of response equipment and much more. Hundreds of FEMA Corps members, and counting, have been been hired by FEMA following their service. In either branch of NCCC, members perform a variety of service in several locations across the country. They often come away with a clearer understanding of what academic or career fields interest them, and new life skills, job skills and connections to help them pursue their dreams. FEMA Corps is an NCCC track for young adults who want to gain professional skills in emergency management while serving with the Federal Emergency Management Agency (FEMA) staff on disaster response and recovery efforts. It is a 10-month, full-time, team-based residential service program that was developed in partnership with FEMA and the Corporation for National and Community Service, the agency that oversees AmeriCorps NCCC. As a member, you’ll be assigned to one of five NCCC campuses. Your focus will solely be on emergency management and long-term recovery and preparedness activities within FEMA. When disasters strike, FEMA Corps teams deploy to devastated communities to assist those in need. For the rest of the year, teams serve at FEMA facilities in exciting metropolitan areas - Washington, DC, New York City, Atlanta, Kansas City, Dallas-Fort Worth, and more - preparing for the next disaster. Projects might include, to name a few: Educating communities by giving presentations to community groups. Developing materials that promote disaster preparation to the public. Ordering materials, tracking inventory, loading supplies, and managing FEMA IT equipment. Assisting with GIS mapping to assist with disaster response or disaster simulations. Updating electronic files, managing data, and writing reports. Working with nonprofits and government agencies to coordinate services for disaster survivors. Helping survivors complete applications for disaster assistance. Assessing and reporting damage to public facilities. Setting up shelter operations and re-unification of families and pets. 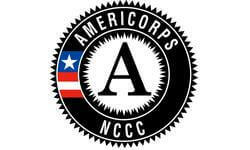 AmeriCorps NCCC is a full-time, team-based residential program for men and women ages 18-24. NCCC members are assigned to one of five regional campuses, where they are trained and placed into teams of approximately 10 members. Teams deploy throughout the region to complete a series of multi-week projects responding to a wide variety of urgent needs. Teams serve with local and national organizations, infusing resources and leading volunteers for hundreds of organizations. These young adults respond to disasters, lead youth development activities, construct and rehabilitate low-income housing, clean up streams, help communities develop emergency plans, and address other pressing local needs. Projects might include, to name a few: Constructing and rehabilitating low-income housing. Constructing or repairing hiking trails in local and national parks across America. Improving summer camp structures and assisting with camp programming. Responding to disasters by operating shelters, removing debris, coordinating volunteers and repairing or cleaning out homes. Removing invasive vegetation and planting new trees. Educating people on sustainability and energy conservation practices. Receiving, inventorying, and distributing donated food and other goods. Making facilities handicap accessible and installing informative public signs. Directly assisting veterans, homeless, and senior citizen populations.